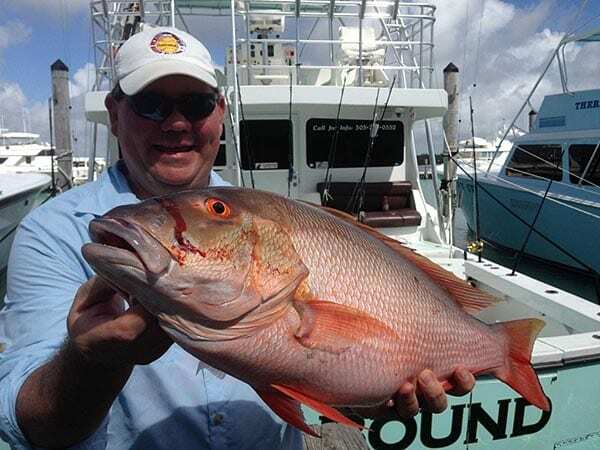 Snapper fishing is just getting started. This week we caught a few larger Vermillion Snapper and just yesterday we caught an almost 15 pound Mutton Snapper trolling. Yes trolling for bottom fish. This is a highly specialized fishing technique. You can troll for Grouper, Snapper, Jacks and more. We were fishing with #8 planners in 60 to 120 feet of water. To get the planers down deep we fish them on 60 pound braid line, and troll just a bit faster than idle speed. We let the planner back until we feel it hitting the bottom, then reel it in just a little. That prevents bait from hooking the bottom. We fish a double hooked bonita strip or ballyhoo covered with a skirt and or sea witch. I like to use larger hooks, either 9/0 or 10. The fish we are targeting have large mouths and fight hard. The larger hooks get better hookups and keep the fish on through the fight. The leaders we use range from 100 pound to as light as 50 pound. We use the heavier leader when targeting grouper and lighter on the snapper. Keep in mind the lighter the leader the better the bait will swim. The more bites you will get. Leader length is also important. When fishing a planner we use at minimum a 50 foot leader, and as long at 100 foot. The farther the bait from the planner the more bites we tend to get.